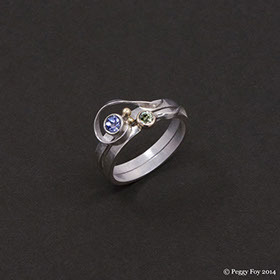 2013 - Stacking Rings; Sterling, 14k, Tanzanite, Green Sapphire. Currently available on Etsy. 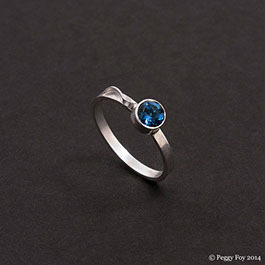 2013 - Stacking Ring; Sterling, Blue Topaz. Currently available on Etsy. 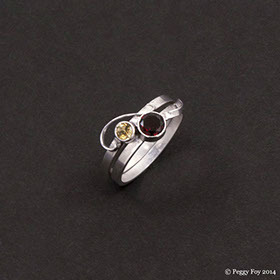 2013 - Stacking Rings: Sterling, Garnet, Citrine. Currently available on Etsy. 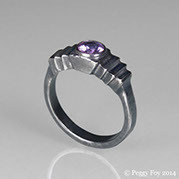 2013 - Art Deco ring: Sterling, purple sapphire. Currently available on Etsy. 2013 - Art Deco ring: Sterling, chrome diopside. Currently available on Etsy. 2013 - Rustic Ruby Ring; Sterling, 14k, Ruby. Currently available on Etsy. 2013 - Chandelier Earrings: Sterling, Kyanite, Cubic Zirconia. 2013 - Martha's Wedding Necklace; sterling, fine silver, kyanite, pearls. Couture wedding creation. 2013 - Martha's Wedding Set; sterling, fine silver, kyanite, pearls. Earrings: sterling, kyanite, cubic zirconia. Couture wedding set. 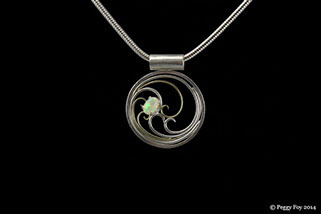 2010 - Opal Pendant; sterling, 10k, opal. Available by special order. 2011 - Steampunk Goggles; Copper, brass, vintage lenses & reflectors, recycled leather. 2011 - Snowflake Ornament; Stainless Steel, pearl. 2010 - Spinner Earrings; Sterling, brass, garnet. Available by special order. 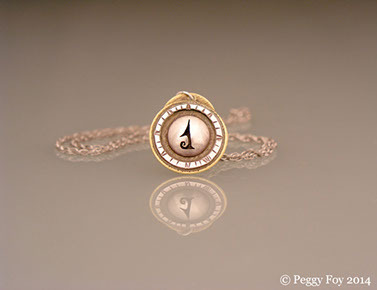 2010 - Star Pendant; Sterling, brass. 2009 - Cloisonne Enamel Pins; sterling, fine silver, lead crystal enamel. 2011 - Hat Pin #5; enamel on etched copper, sterling, brass, steel, magnet, feathers. 2010 - Enamel Hat Pins; enamel on etched copper, sterling, brass, steel, magnet, feathers. 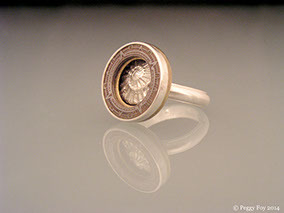 2007 - Insignia pendant; sterling, brass. 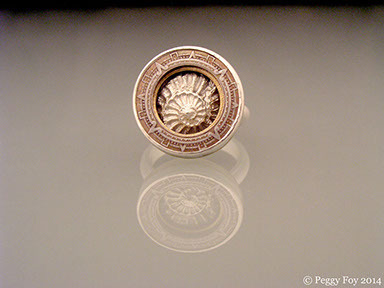 2007 - Mayan Compass Ring; Sterling, brass, steel coin fragment. Similar items available on Etsy. 2007 - Card Box; brass, copper, sterling. 2004 - "Kallisti", sterling silver chalice with moonstones. Undergraduate senior project. 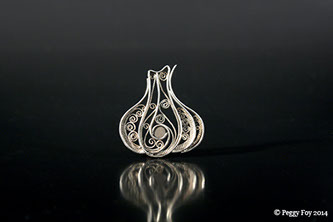 2003 - Filigree Garlic; sterling, fine silver, magnet.